Newspaper articles and television news give credence to the fact that barn and stable fires are often fatal to both horses and humans. Every year, barn fires kill and maim animals and destroy property. In the event of a barn fire, get people out of the barn and call the fire department. Get your horses and other animals out and use fire extinguishers and hoses, but only if you can safely do so. The greatest danger to life in fires comes from the gases and smoke produced by burning materials. 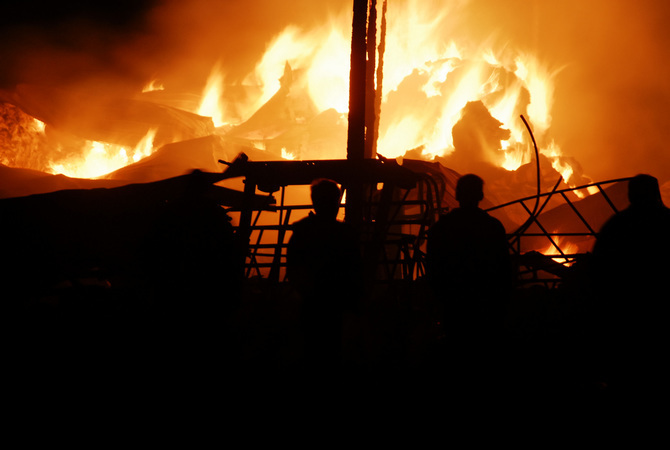 Barn fires are especially dangerous because of plastic and petroleum-based products used and stored in barn areas. Carbon monoxide is a major component of smoke. Colorless and odorless, it is deadly when inhaled and will cause disorientation, dizziness, weakness, loss of muscle control and loss of consciousness in both humans and animals. Smoke from a fire causes eye irritation and respiratory damage. 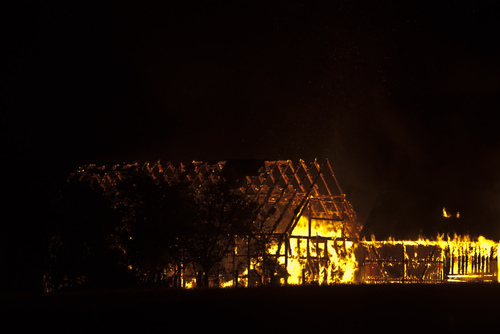 Depending on the concentration of smoke, successful evacuation from a burning barn can be extremely difficult given the frightened state of animals and the possible disorientation caused by inhaling smoke and carbon monoxide. Every barn owner should have a written evacuation plan posted in obvious places in case of a barn fire. The evacuation plan should include information about the number of animals in the barn or stable area and show several routes for removing the animals from any enclosures. It is also important to have an emergency paddock or area to put horses in, in case evacuation of the barn area is necessary. The phone number of your local fire department should be posted by your house phone and any phones in stables or barns along with directions to your barn in case of a fire emergency. In many communities, fire departments have fire prevention programs and will be willing to visit your barn, so they know you and where you are. In addition to visiting your barn, they are often able to offer important advice about everything from brush clearing to fire-preventing electrical solutions. Smoking should be banned within a minimum of 50 feet of barns and stables. Fire extinguishers that are properly up-dated and charged on a regular basis should be kept near every exterior door and next to the main electrical panel box. Hay and all combustibles should be properly stored, and, if possible, kept in a separate structure. All lighting and electrical wiring should be checked several times a year and repaired whenever necessary. Barn and stable layout should be safety-oriented with exits clearly marked for use in case of emergency. Door frames should be a minimum of 8 feet high and 4 feet wide for easy ingress and egress. More than one exit should be provided in all cases and all personnel should be trained in what to do in case of fire. Develop an evacuation plan and post it prominently. Include fire department, veterinarian, and emergency service phone numbers and also include how you can be reached if not on the premises. A 50-foot firebreak should be cleared around your barn by removing grass, brush, trees and debris. Smoke and carbon monoxide detectors that sound a loud external alarm should be installed in every barn and stable area. Have a water and power supply installed outside your barn near the barn doors and keep a water hose attached to the outdoor water supply. Consider installing a sprinkler system. The initial cost may be high, but you may receive up to a 50% discount on your fire insurance each year.